We know that organizations today are facing a significant increase in the rate of change and greater complexities in the issues, opportunities and challenges they face as regional and global growth is demanded. The purpose of Emergent Organizational Development and Change (EODC)™ is to facilitate organizations to conquer these challenges in the 21st Century. Maybe we have to think differently about change – a different mental and emotional framework. Maybe we have to understand change itself, before we can better influence, move with, or adapt to change. Maybe we need a different vocabulary about change itself. Words influence and convey how we ‘see’ things. This goes to the heart of our work in developing the framework and platform in regards to an Emergent Organizational Development and Change (EODC)™ approach. EODC™ develops the capability to continually influence, adapt, shape and organize in line with changing emergent patterns in one’s internal and external environments. People need to understand change itself, before one can better influence, move with, or adapt to change. People are naturally experiential, that is, people learn through their experiences which influence, shape and form their values, beliefs, perspectives, assumptions, attitudes, decisions and behaviors’. Culture is viewed as ‘influencing patterns’ that people consistently and congruently experience over time which emerge as the norms, beliefs, values and practices that guide people in their perspectives, attitudes, decisions and behaviors’. People are naturally ‘self-organizing agents’. People have a natural curiosity for exploration, discovery and the unknown. People have a natural sense to collaborate. Change is natural to people depending on the degree of control and influence in how change occurs. Open, integrated IT/IS system designs and information streams are fundamental and integral to emergent change and creating emergent, adaptive, fluid organizations. One must view an organization and a person as a ‘whole, dynamic, systemic system’. For the most part, the natural human attributes related to emergent change as well as innovation, creativity and optimal performance are depleted by our current institutions, organizational structures, social norms, schools and work environments. As OD practitioners, one of our key focus areas is organizational culture. 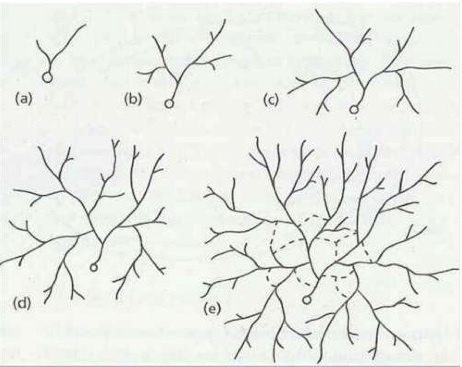 As we proceed to understand emergent change, lets define culture within an emergent process. ‘Influencing patterns’ that people consistently and congruently experience over time which emerge as the norms, beliefs, values and practices that guide people in their perspectives, attitudes, decisions and behaviors’. An ‘influencing pattern’ is a contingency of interdependent patterns that begin to emerge and form into something which has an inherent capacity to influence persons and events. So how does an organization create both the conditions and the ‘influencing patterns’ that help form people’s experiences which then emerge as what is called the culture of an organization? Well, since people are ‘experiential by nature’, one way is to give people consistent and congruent experiences that displays the desired culture of the organization. What if the desired culture is simply ‘experienced’ in a consistent and congruent manner over time emerging and forming the desired norms, values, attitudes and practices? What if certain norms, values, attitudes or practices shifted, or were distinct from the original thoughts of a desired culture? Let’s say some emerge and some evolve as the organization emerges and evolves? What if we can create a ‘living culture’ to emerge and evolve. Traditional planned change management strategies involve sequential steps for altering organizational, group and individual behavior. This method is typically employed once decision makers identify a need for change (Livine-Tarandach and Partunek, 2009; Burns, 2006) after analyzing the environment’s inhibiting and enabling forces (Burns, 2005). Then a sequence of interventions is implemented to sell ‘buy-in’. Kert Lewin (1951), being the father of planned change in organizational studies, developed a three stage model that has been the classic way of thinking about change in organizations – linear models and outside of the real experiences of the day-to-day work world. .
A. Fitting the organization into the ‘model’. B. Doing change to people. C. Changing people and organizations by step-wise, linear, planned interventions by a ‘change agent’. The Fundamentals of Organizational Development. Process and Emergent Consultation approaches. Emergent business structures, systems and processes. Open, integrated IT/IS system designs and information streams. Emergent OD also utilizes some of the core fundamentals of OD such as the dynamics of Emergent Action Research (EAR) and double-loop learning. Emergent OD also engages a triple-loop learning process which is involved in the learning of the change process and change dynamics themselves. We believe that people, leaders especially, need to understand change itself, before an organization can better influence, move with, or adapt to change. I see ‘Emergent Organizational Development And Change (EODC)™‘ as the next generation of OD, again keeping and evolving much of the fundamentals, principles and approaches of OD process consultation. Let’s begin with a distinction: A critical distinction between a ‘process consultation OD approach’ and an ‘emergent OD approach’ is that the former is generally based on dealing with ‘solving a problem’, ‘event change’ workshops, or a ‘special program’ outside of the normal, daily strategic business strategies, systems, processes and work functions. An Emergent Organizational Development And Change (EODC)™ approach is a platform and framework to create an environment and experiences where fluid, natural, continuous, evolving change and development can occur within the key elements of an organization such as strategic business strategies, systems (especially IT/IS), business processes, relationships and work functions. The idea of change as a continuous, natural process (Chia, 1999, Tsoukas and Chia, 2002; Weick and Quinn, 1999) is becoming more prevalent and yet change itself is still often experienced by practitioners and clients as a disruptive project, as a disequilibrium, as related to resistance, loss of security, and fear of uncertainty. I believe this is the current general mindset and is reinforced in the current practices of ‘change management’. In addition, an understanding of emergent change engages two areas of thought that are worthy of mention at this time. 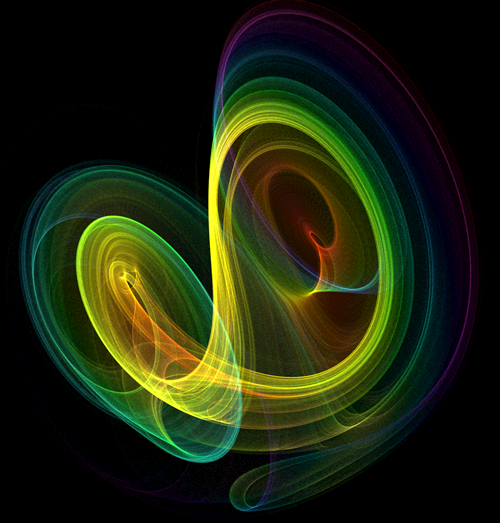 Attractors – elements that form some degree of relationship with other elements. Such may or may not be apparent or form into ‘trends’. Trends – a number of interdependent elements that begin to form some type and some degree of pattern. A trend may or may not continue. Influencers – a number of trends which begin to have a potential to create novel patterns and experiences. An influencer may or may not continue. Pattern Influencers – a contingency of interdependent patterns that begin to emerge and form into something which has an inherent capacity to influence persons, things and events through the experiences they offer. A pattern influencer lives on in both the re-forming of itself through being effected by new influencers, as well as in the experience and the outcome of that experience in others, things and events. Novel Forms – occurs when pattern influencers have begun to shape new forms which have the potential to further influence people, things and events through consistent and congruent experiences. Novel forms may become ‘determinates’. Determinates – when ‘novel shapes and forms’ generate consistent and congruent novel experiences over time to further influence people, things and events that then have the potential to become new norms, beliefs, perceptions, behaviors and a shift in cognitive and mental frameworks in individuals and groups. Closed Sytems, Control and Power Determinates – traditional rigid values, structures and boundaries to create standards of predictability. Open Systems – that which facilitates novel determinates to continually form new influencers, novel forms and novel experiences. Continuous, evolving and emerging change. Guiding Determinates; (Principles, Guidelines and Boundaries); pattern influencers and determinates that shape desired forms of experiences and can generate further novel expressions in open systems of such desired forms and experiences. The Unknown –that which is not part of current emotional and cognitive framework. Disruptors – that which breaks through the status quo to create newness inside and outside of that status quo. A ‘shock event’ to the existing system and framework which drastically creates new norms, beliefs, perceptions, behaviors and a shift in cognitive and mental frameworks in individuals and groups. Inhibitors – that which blocks novelty and newness to occur. Continuous, Evolving, Emerging Forms –open systems that continue to create newness through experiences of determinates and disruptors. Forms; an arrangement of the elements. A particular mode in which something is manifested. Newness – something experienced as distinguished from, or a departure from, what currently exists. Chaos – a natural part of the adjustment process to newness. The more disruptive the change, the greater the extent of chaos can/may occur. Chaos is natural to change. The degree of chaos is related to the density of the experience of change. Ecology – the relation between people (organisms) and their environments. This is a bit confusing to me, being merely human and not a mathematical genius. The term “deterministic chaos” seems to be a contradiction in itself. 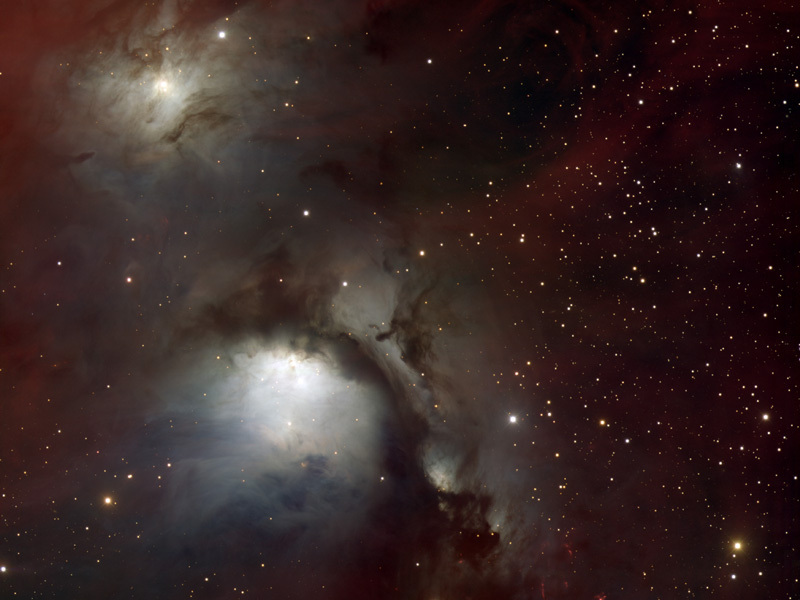 How can something be deterministic and chaotic at the same time? Well, it seems to me that the initial determinants determines some ‘form of guiding boundaries’ or ‘pattern influencers’ and the small differences in initial conditions (influencers) generate non-predictable changes within that guiding form BUT ALSO to the ‘determined form of the guiding boundaries’. A self-evolving dynamic, systemic systems. ‘Pattern influencers’ may have the influence to constantly shift or even transform current patterns that take new forms and functions to continually create evolving and constant change. I’m still working on this self-understanding, but the closest I can come is in cloud formation. Cloud formation is determined by some pre-determined laws of physics and their conditions like hemispheric pressure, wind, sun particles, ground evaporation, etc. – determinants. Initially those conditions will generate some ‘potential’ that a cloud can develop in. At the same time, the continualy changing small differences in initial conditions will create ‘pattern influencers’ and fluidly shape the form and life of the newly forming cloud until the ‘on-going forming influencers’ distinguish the cloud by disbanding the initial determinants -or generate the initial cloud into a massive hurricane. This is my best ‘self-descriptor’ to understand ‘chaos theory’, initial determinants and small differences in initial conditions which generate ‘pattern influencers’ which they themselves will evolve into new patterns which then yield widely diverging outcomes. Thus, the initial conditions also evolve and create more ‘influencers’ on themselves as well as the initial ‘determinants’ as everything systemically evolves, or distinguishes iteself. Another fundamental of ‘chaos theory’ is ‘strange attractors’ simply meaning that in chaotic systems unidentified patterns will form over time as related to the above mentioned ‘determinates’ and ‘pattern influencers’. Figure to left: The Lorenz system is a system of ordinary differential equations (the Lorenz equations) first studied by Edward Lorenz, 1960s. It is notable for having chaotic solutions for certain parameter values and initial conditions. 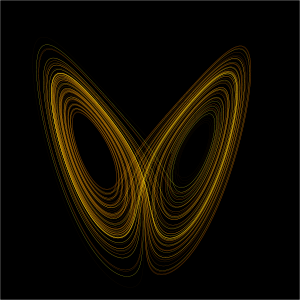 In particular, the Lorenz attractor is a set of chaotic solutions of the Lorenz system which, when plotted, resemble a butterfly or figure eight form. So how does ‘chaoes theory’ relate to a dynamic, every evolving organization? What ‘determinants’ and small differences in initial conditions yield widely diverging outcomes rendering long-term prediction impossible in general? At the same time, how does on-going changing ‘influencers’ shape and evolve an organization to emerge new dynamic patterns? And, how does one become aware and further shape such forming, evolving patterns toward a desired pattern? Can this happen? I say yes, every day, under the right conditions. Wendy H. Mason, in her article ‘Chaos Theory’ states that chaos theory is useful in terms of organizations. “Applying chaos theory to organizational behavior allows theorists to take a step back from the management of day-to-day activities and see how organizations function as unified systems. An organization is a classic example of a nonlinear system (i.e., a system in which minor events have the potential to set off grave consequences or chain reactions, and major changes may have little or no effect on the system whatsoever). In order to exploit the chaotic quality of an organization, one needs to try to see the organizational shape that emerges from a distance. Instead of pinpointing causes in the organization for organizational problems, the company is better served, according to chaos theory, by looking for organizational patterns that lead to certain types of behavior within the organization. Organizational expectations for acceptable behavior, and the degree of freedom with which individuals are allowed to work, shape the way a company’s problems and challenges are handled by its members. By allowing people and groups within an organization some autonomy, businesses encourage the organization to organize itself, enacting multiple iterations of its own functioning until the various pieces of the organization can work together most effectively. An organization that encourages this type of management has been termed a fractal organization, one that trusts in natural organizational phenomena to order itself. However, applying chaos theory to organizational practice tends to go against the grain of most formal management patterns. Order can be confused with the more popular notion of control. Defined by organization charts and job descriptions, traditional management does not generally seek to add disorder to its strategic plan. As Margaret Wheatley states, “It is hard to open ourselves up to a world of inherent orderliness.” Organizations are focused on structure and design. Charts are drawn to illustrate who is accountable to whom or who plays what role and when. Business experts break down organizations into the smallest of parts. They build models of organizational practice and policy with hope that this atomizing yields better information on how to improve the organization’s functioning. However, chaos theory implies that this is unnecessary, even harmful. Are initial conditions in an organization static or continually evolving and create more ‘influencers’ as things evolve? Well, it seems to me that the initial determinants determines some ‘form of guiding boundaries’ and the small differences in initial conditions (influencers) generate non-predictable changes to that ‘determined form’ and also to the ‘determined form of the guiding boundaries’. All the factors below are constantly evolving and new patterns are emerging based on their own newly forming patterns and the interaction to each other as a gestalt. This is the challenge… one way may be to facilitate continuous feedback systems and strategic, emergent adaptation processes. 1. The first is that the system consists of a number of heterogeneous agents, and each of those agents makes decisions about how to behave. The most important dimension here is that those decisions will evolve over time. From this evolution will emerge form. Can emergence be facilitated and can it be influenced? Can one facilitate ‘emergence’ by creating the conditions for emergence to occur to influence a desired state such as an organizational culture? Emergent inquiry is still in its infancy. Applying the ‘emergent perspective’ to wider organizational change is our challenge. The Tayloristic and scientific management paradigm’, with its desire for certainty and controls for predictability is still dominant. The process of working out the practical implications of the ‘emergent organization’ paradigm is still under way. We seek to generate practical approaches and applications for emergence to happen naturally in people and organizations to better raise the ability to adapt to one’s changing environments, create innovative solutions and to deal with modern complexities people face. Tom Peters wrote ‘Thriving on Chaos: Handbook for a Management Revolution’ in 1987. Peters offers some strategy to help corporations deal with the uncertainty of competitive markets through customer responsiveness, fast-paced innovation, empowering personnel, and most importantly, learning to work within an environment of change. Organizational theorist Karl Weick (b. 1936) offers a similar theory to Peters’s, believing that business strategies should be “just in time…supported by more investment in general knowledge, a large skill repertoire, the ability to do a quick study, trust in intuitions, and sophistication in cutting losses.” Though he did not articulate his theories in terms of the explicit ideas offered by quantum physics and chaos theory, his statements support the general idea that the creation and health of an organization (or a system) depends on the interaction of various people and parts within that system. “Organizations lack this kind of faith, faith that they can accomplish their purposes in various ways and that they do best when they focus on direction and vision, letting transient forms emerge and disappear. The big question here is: “What are the implications for an OD practitioner to create constructs, methods, processes and tools to support this most exciting and effective approach to organizations? I believe this is the challenge as we talk about ‘innovative, adapting organizations’. I also believe that to accomplish such, organizations need to move away from hierarchical structures and more into ‘network, fluid structures with de-centralized nodes, supporting technical systems and a breakdown of traditional power structures (and much more – too many to write about here). It is my belief and experience that a new ‘paradigm’ of transformation is needed. Emergence, chaos and complexity are natural to our sense and motivation to explore. This is partially based on the assumption that we, as humans, are born with a natural curiosity and comfort with the ‘unknown’. Such is innate in us. Our socialization, parental practices, our education, our work experiences, our institutionalization in general block that ‘naturalness’ from us as we learn to assimilate and accommodate new norms, perceptions and beliefs through our lives. In other words we hear a lot of ‘no’s. and ‘watch outs’, and ‘you can’t do that’… and finally we drive that natural curiosity out of our natural ways of being. With organizations, the traditional structures (hierarchical), roles, status levels, power dynamics, communication dynamics, systems, processes, competencies, perspectives, how we ‘see’ organizations, etc., etc., actually INHIBIT the natural human nature to explore, to create, to innovate and to collaborate. In addition, what type of ‘culture’ does all this traditional stuff create? What do people ‘experience’ day-to-day in their work world(s)? What is the impact to performance, as well as people’s lives? So what about ‘the natural flow of emergence’ – how does that come about? Is such a simple but also a complex human conversion? Basically one key foundation has to do with a shift in one’s ‘cognitive and emotional mental frameworks’ within an environment that supports and reinforces safety, exploration and appreciation… one that I am writing and speaking about… and soon will post more about how to create such even in the most hierarchical, controlling, static environments. The following diagram is simple a summary of the four consultative models and their relation to four fundamental dynamics of effective change on a very simple level. 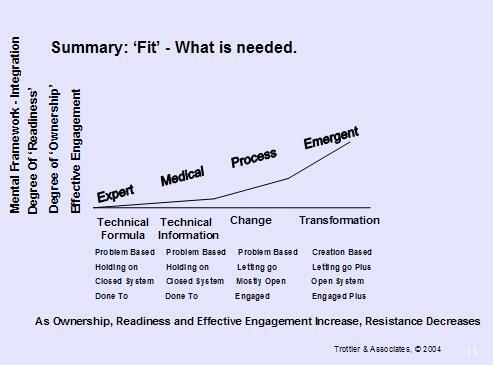 The focus here is on ‘fit’ and the degree of ‘need’ in regards to these four underlying dynamics in relation to the type of consultation approach needed to ‘fit’ a certain situation. 4. Effective engagement (the emphasis here is on ‘effective’. This has been a somewhat brief write-up regarding ’emergence’ as one of the four basic consulting paradigms. It is not to say one is better than another – the value is based on what the situation calls for and the desired results. What is important to note here is that each model /approach has a different degree of need to create ‘ownership’, ‘readiness’, ‘effective engagement’ and ‘a shift in mental and emotional frameworks’ in change and development efforts. Currently, I have begun to assemble an international group to identify the fundamental elements, their attributes and core dynamics to create a fundamental platform relevant to ’emergence’ processes for practical applications. Can one facilitate ‘emergence’ by creating the conditions for emergence to occur in people and in organizations? I believe the answer is ‘Yes!’. I believe that an approach to create fluid, evolving, adaptive, emerging, living organizations is needed to deal with the complexities we face in our rapidly changing world. I hope you have gotten something out of this post. This entry was posted in Change, Consultation Models, Culture, Emergent Change, Emergent OD and Change, Emergent Organizational Development, Emergent Organizations, Leadership, Organizational Development, Patterns, Perception, Performance. Bookmark the permalink.